Combine the salt, coriander, pepper, cinnamon, and nutmeg and sprinkle spice mixture evenly over pork slices. Add the pork to the pan and cook until desired degree of doneness (about 3 minutes on each side). Remove pork from pan and cover with foil. Melt butter in the pan and add apple slices, shallots, and a pinch of salt. Saute until apple starts to brown (about 4 minutes). Add apple cider to pan and cook until the apple is a crisp-tender (about 5 minutes). Stir in the thyme leaves and season to taste with salt and pepper. Drizzle the apple mixture and sauce over pork and serve. I’m not much of a pork eater but that photo makes me want to try this out. I really looks good! I can see how the apple taste enhances the taste of the meat – this looks like a winning recipe. Oh my gosh, yum! I’m not usually a huge lover of fruit in savory dishes (I know, I know, I need to get over it) but this dish would be my kicker. Great color on the pork too! What great flavor combinations! I love cooking with shallots. They are one of my favorite ingredients to work with. Now pork can be even juicier… the USDA lowered the recommended cooking temperature of pork to 145F like beef and lamb! MMMMM! That is such a good meal! I love the combination of pork with apples! I love the combination of pork with apples! Yummy! I was looking for a good recipe like this. It looks so good!!!! I’ll try it! This looks amazing! 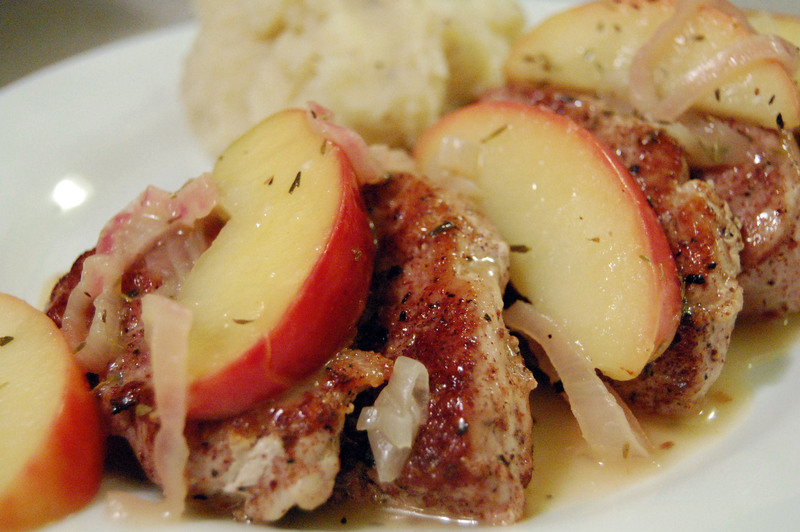 I have a pork chop recipe with shallots, thyme, and apples. This would be a great one to try as well! You’ve provided a few personal touches to the traditional entree of pork and apples(or applesauce). Keeping the apples crisp-tender is a good suggestion, as they’ll provide a nice textural contrast to the silken pork tenderloin. I love pork tenderloin and this recipe and pictures make my mouth water. Fantastic!